due to the user's setting the charge rate improperly. It will disconnect the circuit automatically and initiate an alarm if there is any malfunction. All the operating modes of this charger are controlled through two way communication, between the charger and the battery to achieve maximum safety. All the settings can be configured by the user. iMax B6 employs an individual-cell-voltage balancer. It is not necessary to connect an external balancer for balance charging. During the process of discharging, the eXtreme 605 can monitor and balance each cell of the battery individually. An error message will be indicated and the process will be ended automatically if the voltage of any single one cell is abnormal. iMax B6 is adaptable to various types of Lithium batteries, such as Li-ion, LiPo and the new LiFe series of batteries. There are various methods of charging Lithium batteries. "Fast" charge reduces the charging time whereas "store charge" can control the final voltage of your battery. This method is best for long term storage and protects the useful life of the battery. Delta-peak sensitivity: The automatic charge termination program based on the principle of the Delta-peak voltage detection. When the battery's voltage exceeds the threshold, the process will be terminated automatically. 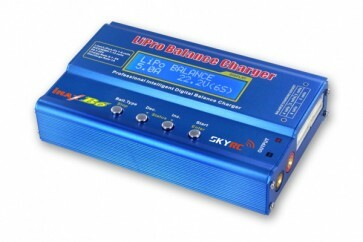 You can set the upper limit of the charge current when charging your NiCd or NiMH batteries. This is useful for NiMH batteries of low impedance and capacity in the 'AUTO' charging mode. reached (set by the user), the charging process will be terminated. This function is available by connecting an optional temperature probe, which is not included in with the charger. The user can set the maximum charging time. If the charging time exceeds the limit, the process will be terminated automatically when you set the maximum time for the charging mode. type and "call up" these settings to charge a battery without additional programming needed. Batteries can be set to charge/ discharge for 5 cycles if needed.